I have pondered this quotation many times; it makes me very aware how we “tremble each other’s webs” all the time. Sometimes in large ways, sometimes small, although we rarely know when it happens. An example: I’m a total grouch early in the morning. I would drive to school each morning, grumbling about all those children I was going to have to be nice to, wishing I could just be left alone. But then, in the parking lot, a child would run up to me exclaiming, “We have music today, Ms. Rice. I can’t wait!” “That’s great, Maryann, I’ll see you soon,” I’d say, and my grumbly web would be shaken. Then two boys would come up with, “Can we help you carry the autoharps, Ms. Rice? At home I’ve been singing that song you taught about Charlie on the MTA. And my mom knows it.” By the time I’d reach the school door, I’d be feeling chipper and looking forward to being with the children. They trembled my web. They never knew it. Now here is a story of something major that happened this summer. Friends of Kakamega decided to provide a SunKing Solar Light for every child/youth in our program. For this we needed to raise over $8,000, a hefty amount. But because clean, renewable light in a home is so important, we made this commitment. It happened! But it wouldn’t have happened without one of the people going on our summer trip to Kakamega, a college student named Liz, researching solar lights. She discovered this unique light, specifically designed for Kenyan homes and convinced Friends of Kakamega to make the big commitment. She trembled our imagination. Backing up the web: Liz wouldn’t have gone on the trip except she had gone to school with Mitch Newlin, who has been to the Care Centre seven times and is now a valuable member of the Friends of Kakamega board. He trembled her web with stories of the Care Centre. But Mitch never would have gone to Kenya except he attended a benefit dinner at Durham Meetinghouse when he was 12 and exclaimed to his parents he wanted to go to Kakamega Care Centre when he was old enough. When he turned 16 in 2011, he went with his dad, John, and the rest is history for Mitch. The Care Centre has trembled his web in a huge way and his whole life will be different because of it. The trembling doesn’t stop there. 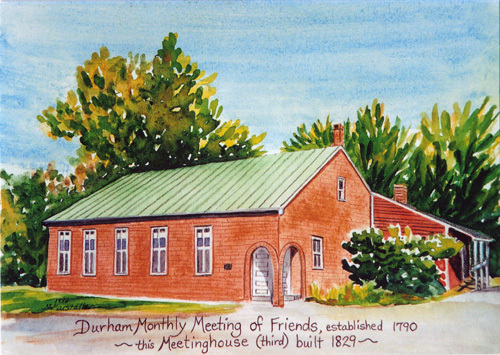 Durham Meeting wouldn’t have held that benefit dinner (and all the subsequent ones) except that Dorothy Selebwa, founder of the Kakamega Orphans Care Centre came to Durham Meeting one Sunday at the end of April 2002. She trembled my web and turned my life upside down, as this project has done for so many people: children and families in Kenya, and for Americans who have visited and experienced themselves the hope and miracle of the Care Centre. Lydia Rollins, Margaret, Clarabel. They made me feel so welcome and I wanted to make it my home. So, because the women of Durham meeting trembled my spirit, I was there so Dorothy could tremble my web – and that of Durham Friends. Mitch’s web was trembled. His telling Liz about the project trembled her web. She decided to go, and did research on solar lights. Her research influenced Friends of Kakamega’s determination to provide solar lights for 260 homes, which has had a terrific impact on the lives (and webs) of so many people. “Who knows where the trembling stops or in what far place and time my touch will be felt.” May we all keep trembling each other’s webs and let the trembling live on!